This article lists political parties in Liberia. 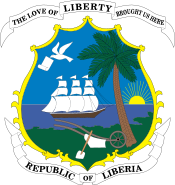 Liberia has a multi-party system with numerous political parties, in which no one party often has a chance of gaining power alone, and parties must work with each other to form coalition governments. This page was last edited on 18 October 2017, at 10:25 (UTC).